The first ever Christchurch Maths Craft Day was held on Sunday 18th June in the Great Hall at the Arts Centre, and was a great success. The day-long event combined eight hands-on craft stations with a series of public talks. 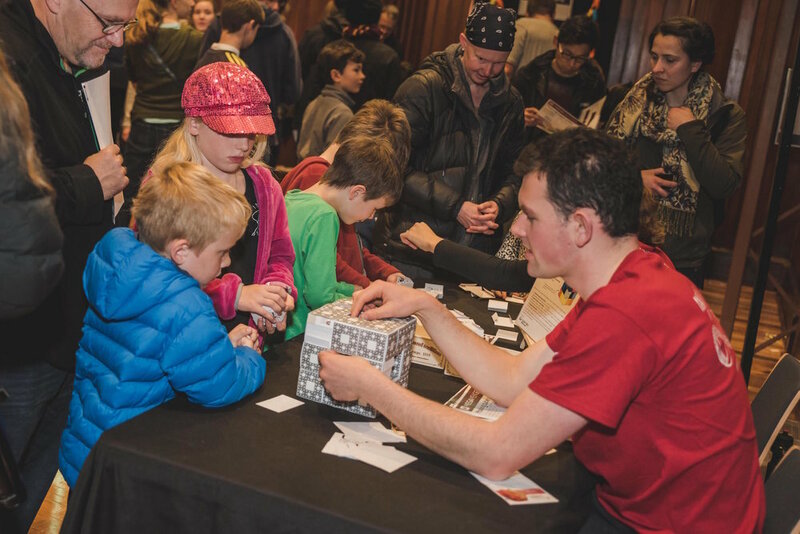 Nearly 1,800 visitors tried their hands at a range of mathematical crafts including creating string art, folding an origami cube, building a fractal sculpture, making a Möbius strip, flexing a hexaflexagon, crocheting a hyperbolic plane, drawing and colouring mathematical objects, and exploring Penrose tilings. The craft stations and the large crafting area were staffed by an enthusiastic team of volunteers, drawn from University of Canterbury students and staff, and local school teachers. Doors opened at 10am, and the Great Hall was buzzing when Lisa Davies of One News arrived at 11am. Her piece on the Christchurch Maths Craft Day, including interviews with Jeanette and Phil, aired on the news that Sunday evening, and was shown later on Seven Sharp. Our morning speaker was Associate Professor Clemency Montelle of the University of Canterbury, who led a packed audience through a hands-on demonstration of the surprising amount of mathematics in our clothing. It’s not every day that a mathematician is seen publically tying children together with oversized t-shirts in the name of science! The audience was spell-bound and entertained while learning about the topology of clothing. Dr Patrick O’Sullivan, Head of Classics at the University of Canterbury, gave a fascinating talk on the ancient Greek connections between maths and beauty while surrounded by the unique collection of ancient artefacts in the Logie Collection housed in the brand new Teece Museum. Many of our visitors also enjoyed the Museum, which had even higher visitor numbers that day than on its opening weekend. Our final talk of the day was given jointly by Professors Hinke Osinga and Bernd Krauskopf of the University of Auckland. Hinke and Bernd spoke about the Lorenz manifold, a fascinating mathematical object which is important for understanding chaotic systems such as the weather. Hinke and Bernd worked out how to turn their mathematical calculation of the shape of the Lorenz Manifold into a crochet pattern, which Hinke then crocheted. They also commissioned a metal sculpture of the Lorenz Manifold. Their engrossing talk covered the maths, the craft, and the art of the Lorenz manifold and led to many discussions afterwards. The Christchurch Maths Craft Day took place at The Arts Centre in Christchurch. The craft activity stations were located in the Great Hall, a beautiful space opened in 1882 which has been lovingly restored following the local earthquakes. The public talks were held in the Recital Room and the Teece Museum at the Arts Centre. Parking is available at the Art Gallery car park on Gloucester St, the car park opposite the Great Hall (which has entrances on Worcester Blvd and Rolleston Blvd), and various nearby Wilsons car parks, along with some parking on adjacent streets. More information and maps are available here.